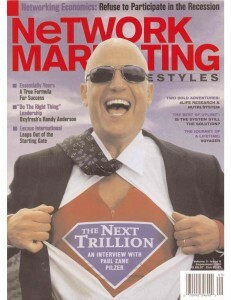 Why network marketing is poised to drive the next major economic powerhouse. An earthquake is coming. In fact, its preliminary tremors have already begun. The economic foundations are perceptibly trembling; hairline cracks are spidering out along the plaster walls of our domestic spending habits; neatly framed pictures of current fiscal reality are starting to tumble off those walls. Looks like it’s gonna be a good 8.0 on the economic Richterscale— or higher—and only one man seems to have ears keen enough to hear it coming. Every generation, among the thousands of brilliant and merely-bright social commentators, the human race produces one or two visionaries whose stunning insights burst the bounds of their own specialist’s expertise and cut across all disciplines. We have our Benjamin Franklins, our Buckminster Fullers–and Paul Zane Pilzer, the man who sizes up seismic shifts in our economy. Pilzer is quick to assert that he has no crystal ball: it’s all in the data. But the three-time New York Times best-selling author and economic advisor to two presidential administrations has an uncanny knack for assembling masses of facts and figures and seeing the forests those reams of trees represent. His penetrating insights have attracted the attention of network marketers for over a decade. Now he’s back, with a new message: We are witnessing the explosive birth of a new trillion-dollar industry, and network marketers everywhere are poised to be the vanguard of that explosion. He is describing network marketing. He is, as the saying goes, singing our song. NML: Paul, you were the first well-known economist to have anything kind to say about network marketing. What got your attention about the business in the first place? Paul Zane Pilzer: I think it would be more accurate to say that the business found me. It started with my 1990 book, Unlimited Wealth, which analyzed different sectors of our economy and projected some interesting changes by the year 2000. In the 70s and 80s, we were told, “What’s wrong with America is that we don’t make things.” So, the bright young people of that era started to make things–and they did it so much better, converting all the expensive raw materials and labor into plastics and flexible automated manufacturing processes, that they completely restructured the economics of retail. Take a typical $300 item; it could be anything–say, a television, camera, or dress. In the 1960’s, the manufacturing costs of this item would be $150. About 50 percent of the item’s cost was in manufacturing, with the other 50 percent in distribution. By the 90’s, the same item still sold for $300, but it was a far superior product with a great many more features–yet its manufacturing cost had fallen from $150 to $15 or $20! Now 80 to 85 percent of the product’s costs was in distribution; only 15 to 20 percent was in manufacturing. By 1990, I explained in Unlimited Wealth, the greatest opportunities for wealth were no longer in manufacturing but in distribution. The book projected that this would continue for the next decade at least. That’s why the richest people in the world in 1990 were people who found better ways of distributing things, versus better ways of making things. NML: Can you give us some examples of those “richest people” who made their fortunes in distribution? In 1990, Fred Smith was the most successful airline entrepreneur of the day. Back in 1976 he had started an airline with its own fleet of planes and pilots–yet it didn’t fly people! The only purpose of Federal Express was to move packages: distribution–an unheard-of thought in 1976. Ross Perot was one of the wealthiest people in the world in 1990. Perot built a $3.5 billion computer company that made neither software nor hardware. What did EDS do? It distributed other people’s hardware and software. NML: How did your observations about wealth and distribution get network marketers’ attention? I had no idea what Amway was. I didn’t even know what network marketing was. I wasn’t trying to promote anything; perhaps that’s one reason my research rang true. I was just using empirical data, analyzing distribution in America and the world. Dexter’s people decided to book me as a speaker and have me explain to their people what I’d said on “Larry King Live.” That’s how it all started. NML: That was over a decade ago, and you’ve since become a household word to thinking network marketers everywhere. Obviously, your thinking hasn’t stood still; what has happened in the ten years since? Paul Zane Pilzer: I’ve changed my focus a good deal. Back in 1990, the opportunities still lay in physically distributing products; since 1990 we’ve seen a dramatic shift. In my new book, The Next Trillion, I break distribution into two functions: physical and intellectual. Physical distribution means getting the product to the consumer–products that the consumer already knows he wants. That’s Walmart: You know exactly what you want when you walk into Walmart; you go in, pick it up, and get out of the store. You don’t learn about anything new there. Intellectual distribution is where you learn about a new product or service that you didn’t know existed before. Up through 1990, the great opportunities to earn fortunes in distribution, the opportunities for the Fred Smiths, Ross Perots, and Sam Waltons were in physical distribution. Today, the great opportunities are in intellectual distribution. Paul Zane Pilzer: In 1999, a business person made Time magazine’s man of the year–especially meaningful because it’s quite rare for a business person to earn that distinction. Who was it? Jeff Bezos, who revolutionized the distribution of books with amazon.com. Now, look closer: Jeff Bezos is really in the intellectual distribution business. You don’t sign on to amazon.com just to physically get the book; you sign on to learn about the book. You read the various reviews, look at other books in the category, you may even log on to find out if there even is a book on the particular topic you want. The truth is, the great part of the physical distribution boom that I described in Unlimited Wealth has already come and gone; the fortunes to be made there are largely already made. The fortunes that will be made in the new millennium–at least in the first decade of the new millennium–will be more in intellectual distribution: educating consumers about products and services that will improve their lives, products, and services that they didn’t already know existed. NML: Why is that where the real opportunities are today? Paul Zane Pilzer: Because that is precisely where the biggest bottleneck is today. There was a time when the two aspects of distribution–physical and intellectual–were commonly combined under the same roof. No longer. If you’re as old as I am, you might remember the first few times you went into a store and said to yourself, “Hey, I know more about this product than the clerk selling it!” Twenty-five years ago, that was a shock: who would think of opening a store where the clerk didn’t know anything about the product? Today, it’s universally accepted. Today, you the consumer are expected to know about the product. There are a few specialty retailers left, such as Nordstrom’s. But in general, the retailers have completely abandoned the traditional function of teaching people about products. Instead, they have focused on the function of efficiently and inexpensively delivering the product. Go into a showroom and talk to a car salesman: does that salesperson actually own the car you’re talking about? Not likely. Go into an electronics outlet: how often will you meet a salesperson who actually owns the particular product you’re considering–or who can even afford to? Seldom. These people are in the business of showing you where to find it on the shelf; they’re not there to teach you what it is. NML: So, where do we learn today? I saw this with some educational software we developed in the early 90s: here was a product that could totally change a child’s life–but telling people about it was far more expensive than producing it. Until we found the Amway Corporation in the mid-90s, we were pretty much dead in the water: we had great new products, but no way of telling the consumer that they existed. NML: How does network marketing’s way of doing that contrast with more conventional ways of marketing–through advertising and other mass channels? Paul Zane Pilzer: Network marketing today is almost wholly intellectual distribution. When you as a network marketer discuss a product with a consumer, you don’t actually hand over the product. You rely on UPS or some other delivery service to have the product shipped to your consumer. Even more fascinating is that network marketing today is typically done person-to-person by someone who is also a user of the product. Unlike the car salesman, electronics salesman, or clothing salesperson, the network marketer is an educated, enthusiastic, experienced user of the product you’re asking about. Those companies that prosper in network marketing will focus almost entirely on intellectual distribution, teaching people about new products and services that will improve their lives. Those that really flourish will have some sort of unique or proprietary technology. And not just unique, but efficacious–better than anything else out there. NML: So you’ve seen the weight of opportunity shift from manufacturing, to physical distribution, and now to intellectual distribution. How else has your own thinking changed? What is the focus of The Next Trillion? Paul Zane Pilzer: I started to focus on the great needs of America–which led me in some surprising directions. People think of their needs in a very mundane way–“I need a new dress that doesn’t make me look overweight,” or “I need a car that gets better mileage.” I looked at it on a more macro level: we have more fundamental needs, such as eating, sleeping, being healthy, being educated. As I carefully studied current conditions, I found that the greatest need in America today is wellness. NML: Can you define “wellness” for us? Paul Zane Pilzer: This is such a new need that the word itself, in the context we’re using it, is an entirely new term. I had to come up with entirely new definitions. First, I had to realize that what we call the “health care” business is really the sickness business. Our medical industry today has very little, if anything, to do with health. The $1.4 trillion we spend on medical care, which is one seventh of the U.S. economy, is concerned with being sick and treating the symptoms of sickness. It has very little to do with preventing illness, with being stronger or healthier. When you go to people in the medical industry today and say, “I have arthritis, I don’t see as well, I don’t hear as well.” They say, “It’s because of age–age, age, age, age.” But these things are really just symptoms of poor nutrition. I define “wellness” as money spent to make you feel healthier, even when you’re not “sick” by any standard medical terms. To make you stronger, to make you see better, to make you hear better, to fight what we might call the symptoms of aging. Walk into any average home in any average neighborhood, talk to them, see what they need. If we were doing this 20 years ago, we’d find that most of them were worried about making a living, about their new job, about what professions their children should go into. The primary need for Americans in our first 200 years was economic. That’s no longer true. Today we are in the eleventh or twelfth year of an unbelievable economic expansion. Here’s what you find today as you walk into each home: They have enough to eat, they overwhelmingly know where their economic opportunities are, they know what they could be doing to make more money, and if they’re not, it’s often by positive choice–for example, because they want to spend more time with their families. The overall primary need today is not their wealth–it’s their health. In the past, we’ve associated poverty and economic depression with ill health. When I was young, we often equated “poor” with thin, starving. “Thin rich man” was an oxymoron. Today, “poor” and “fat” have become synonymous. The tables have turned: “rich fat man” has become an oxymoron! Today, the lower the income, the more we see obesity. Obesity is a symptom of poor nutrition. Typically someone who is obese is also vitamin-deficient, suffers from fatigue and arthritis or other ailments that all stem from poor nutrition. Since 1980, we have more than doubled the percentage of overweight and obese people in our country. In 1980, 15 percent of the population was obese; by the year 2000 that number had jumped to 27 percent–that’s 77 million clinically obese people! Those numbers have increased ten percent in just the past four years and are still growing at beyond epidemic rates. Because of people being overweight or obese, we’ve also tripled the propensity to get diabetes in this country, with similar increases in so many other diseases. Today, at a time of unprecedented economic prosperity, we’re seeing a huge part of our population falling off the edge. For me, here is the most amazing number: 61 percent of the United States population is overweight. That number, too, has doubled since 1980. NML: Is there a ray of sunshine here? Paul Zane Pilzer: More than a ray; in fact, as grisly as this situation is, it has also given rise to an entirely new economic sector, a very positive sector–which is where I got the title The Next Trillion. NML: Why do you call this the “next” trillion? Paul Zane Pilzer: Today, the food industry represents about one trillion dollars annually; the “sickness business” is another trillion (actually, about $1.4 trillion). These two industries feed one another in a fairly insidious way because such a huge part of sickness today is caused by the poor nutrition supplied by the food industry. These two trillion-dollar industries work together to support that horrifying 61 percent overweight number. Looking at those numbers, you might think that one day soon, everyone will be overweight or obese. That’s actually not the case, though. The 39 percent of the U.S. population who are not overweight comprise 10 to 15 million Americans who are aging; as they age, they are getting more healthy, more fit, more strong–actually younger, by any standard medical definition. These people represent that new economic sector. They are primarily wealthy people; the first thing they do as they start to have money is to figure out how they can be healthier–and they’re doing it outside the medical establishment. They are going to fitness clubs, watching their food, taking the proper amounts of vitamins and minerals, and investigating supplements and other products that support their wellness. When I began to see this trend clearly, I started wondering, is there a business here? The answer stunned me. In the year 2000, wellness in America was already a $200 billion industry; about half of that is composed of the $24 billion spent on fitness clubs plus the $70 billion spent on vitamins and minerals. This $200 billion was hardly a blip ten years ago. NML: Who is spending this money? Paul Zane Pilzer: Mostly Baby Boomers: prosperous people from the ages of 35 to 55. The Baby Boomers are a powerful economic force; all marketers know that. Baby Boomers represent only 28 percent of our population–yet that group represents 50 percent of our economy. Baby Boomers are the first generation we know of in recorded history who refuse to accept the aging process. This is fascinating, from a marketing standpoint. Look at the cars they buy: they’re retro, designed to make them look like they’re in high school. Look at the clothes they buy: they’re retro, too–they look like the clothes they wanted but couldn’t afford to buy in high school. Up until now, the Baby Boomer marketing mind has been all about how to make them feel younger, how to help them remember what it was like to be young. Now it’s gone a step further. Today, Boomers are starting to buy things that actually make them younger! This has only just begun. Most people don’t even know there are such products. As the rest of this 50 percent buying-power group learn about wellness, this sector will explode. It has already gone from virtually zero in 1990 to $200 billion today. It’s easy to see that this $200 billion will become one trillion–or more–by the year 2010. Paul Zane Pilzer: Oh, all the time. But put it in perspective. The first IBM PC came out in 1981–and by 1990, PC sales exceeded automobile sales. Nobody knew what the Internet was in 1990; consumers were allowed to get on the Internet with their own accounts and private email addresses only in 1995. By 2000, the overwhelming amount of new wealth and new millionaires in this country were being created by the Internet. Given how fast these new industries grow, one trillion in wellness by the year 2010 starts to look like a conservative projection. NML: Does that same challenge of the bottleneck, the need for intellectual distribution, apply to the wellness industry, too? Paul Zane Pilzer: Absolutely. By definition, all of wellness is new technology. There is virtually no place to go learn about it. If you go to a conventional weight loss clinic, they are focused on marketing their processed food products to you–they don’t give you lessons in wellness. The information just isn’t out there; all the research in the medical business is on sickness. Where does the consumer turn? The only way to learn about wellness is through someone close to you who has had a wellness experience. You see your college roommate and go, “My God, John, you look great! You look so healthy–what did you do?” You bump into a wellness experience and start to find out that there is a whole wellness industry out there, with all sorts of new products and services. Now, how could it be that a product like glucosamine, a natural substance which has been around for 50 years (primarily as a veterinary product for horses), a product that rebuilds my cartilage and makes me feel so good … how could it be that nobody knows about it? That’s the classic introduction to wellness: typically, you have one experience like that, then you say, What else might there be that my doctor never told me about? This experience set me on the path of learning about supplements, vitamins, and minerals. In my research for writing this book, I was amazed at how much basic biology and nutrition had escaped my education. Here I am, a college professor for 20 years, three-time New York Times best-selling author–and I had been frankly oblivious about food, nutrition, vitamins, minerals, and natural supplements. That set me on this path of inquiry. You couldn’t really have gone into wellness 10 or 15 years ago because there was no wellness industry. Most of these products and services are just now coming out of the laboratory. And when you look into those laboratories and see what’s coming, you realize that this business is really going to take off. Of anything I’ve ever been involved with, the wellness industry looks the most exciting right now. NML: What connection do you see between network marketing and this wellness revolution? Think for a minute about how you watch TV. You’re sitting back, you’re relaxed, on your couch; the last thing you want is to be challenged with new information. In fact, when you do see something that challenges you, something that disagrees with what you already know or think is true, what do you do? NML: You change the channel. Paul Zane Pilzer: Right! Television is a very passive medium for learning, so we can’t really use it to teach new ideas. It’s the same with newspapers. I used to write op-eds regularly for various newspapers such as The New York Times. I’d be at a cocktail party, excited about a piece I’d written, and ask a friend, “So, what’d you think about my piece on such and such?” He’d say, “Paul, I don’t read your stuff. I’m a Democrat!” We don’t read the op-ed pieces that challenge us. We read the ones that reinforce what we already think. Most of our information sources today have become passive media. You don’t spend time with them to be challenged; when you do encounter something that challenges you, you change the station or read the other column. The only time you learn actively, meaning that you actually start taking in and considering new information, is when you start talking with someone in a real-life dialogue. First, the person says something you don’t agree with. You think, “Oh, that couldn’t be true.” Perhaps you don’t say anything, because you’re being polite–but your face gives away the fact that you don’t agree. This starts a dialogue: they come back with a little more, you start to respond … gradually, bit by bit, the dialogue changes your mind. Correct information about diet, nutrition, vitamins, minerals, and supplements is almost all contrary to what we’ve heard from our medical community; for many, it runs counter to how we were brought up. There’s so much inaccurate information out there; people are conditioned for it. When they first hear new, good information, naturally they’re going to be skeptical. The only way they will actually change their paradigm or start to learn new information is person to person–because they’re actively engaged in a conversation. This doesn’t happen overnight. It may take three, four, five, or six conversations with different people before you actually change your mind. That’s why wellness, which is so clearly paradigm-changing information for so many people, really works best in a one-to-one interactive environment–like network marketing. NML: What do you see for the decade ahead, Paul? Paul Zane Pilzer: I see a one trillion dollar wellness industry by the year 2010. I see great opportunities for network marketing and network marketers. I see certain network marketing companies, because they’re the fastest way to get the new information out there, leading that industry. I see great opportunities coming for the network marketing industry because network marketing is clearly the best vehicle we have today, in the United States and around the world, to educate people about new products and services. There’s a great window of opportunity for network marketing companies to educate consumers about wellness products and services. I also see great challenges ahead for successful network marketing companies, particularly those involved in wellness, as the technology continues to evolve. Network marketing companies need to remain flexible so they can stay ahead of new technology. The best wellness products and services of yesterday may not be the best products and services tomorrow. The personal computer industry is an apt analogy; entire companies have come and gone because they made, say, the best fax software–until someone came up with a better fax software, or because they made the best high-end monitor card–until every computer started coming with a high-end monitor card already built in. Many of today’s network marketing products will go to retail fairly quickly. You’re already seeing that with glucosamine and a number of the other supplements: they’re starting to get into the conventional retail channels. To stay competitive, network marketers are going to have to stay ahead of the new technology. I see consolidation in the industry. Many of the smaller network marketing companies will not have enough money for the R&D they need to compete with the new technologies. I see merging of companies, as well as companies enlarging their product offerings. Companies who can serve more of their customers’ needs will be the most successful. I see real clinical trials. The products of the wellness business are moving toward an era of greater quality control. Today, a third to a half of the bottles in retail stores do not have in them what is on the labels because it’s not a regulated business. The company whose sole business is wellness has a lot more to lose if they make a mistake: they often have better quality control. Ultimately, none of the successful wellness companies can afford to have a bad quality product out there. NML: As a part-time rabbi and someone who has been vegetarian (as you say in your book, for spiritual reasons), you’ve become pretty passionate about wellness, haven’t you? Paul Zane Pilzer: It has become something of a mission for me, and I think it is for network marketers as well. As much as we focus on the financial and lifestyle benefits of the business, the real benefit is what you can do to change a life–and the lives of all the people who are touched by that life. If you can add five, ten, fifteen years to someone’s life, think of his children, think of his spouse. We’re wonderfully interrelated in the world today, and when you can give someone the gift of wellness, improving the quality of that life every day and increasing the length of that life, it’s a truly wonderful thing. Make no mistake: there is a crisis, a trend of epidemic proportions going in the other direction in the rest of America. Right now, network marketing is the only force I see on the horizon that has the potential to make this kind of huge change.